Delivery Information: Please allow 3 to 5 business days for orders to be processed, plus standard transportation delivery time. work-arounds to circumvent skylights, vents, chimneys, pipes, etc. or when different size panels are combined. splits and continues onto a west roof. "System Hardware Kit based on installation application"
instead of a Split Kit. 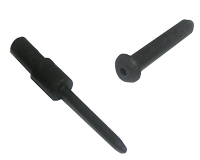 *CPVC withstands high temperatures and requires all-purpose CPVC glue. If PVC glue is used, it may result in leakage. ****Included only when selecting 1.5" Headers with 2" piping.